pizza (Italian); mujadara (Middle Eastern); Subway (American); Greek salad (Greek). As for Saturday dinner, my husband asked me to bake some Russian piroshki, he loves it! "in the first place, make a pasty in four sections. Into one of the section put the sturgeon's cheeks, and into another section some buckwheat, young mushrooms and onions, ... and anything else that you may find suitable--anything else that you may have handy. Also, bake the pastry to a nice brown on one side, and a bit lighter on the other. Yes, and, as to the bottom side, bake it so that it will be all juicy and flaky, so that it shall not crumble into bits, but melt in the mouth like the softest snow that you ever heard of." Food anthropologists argue about the age of Russian fish pie - kulebyaka: some say it's been around since XVI century, some date it as early as XII century. But sure enough is was popular among both reach an poor. 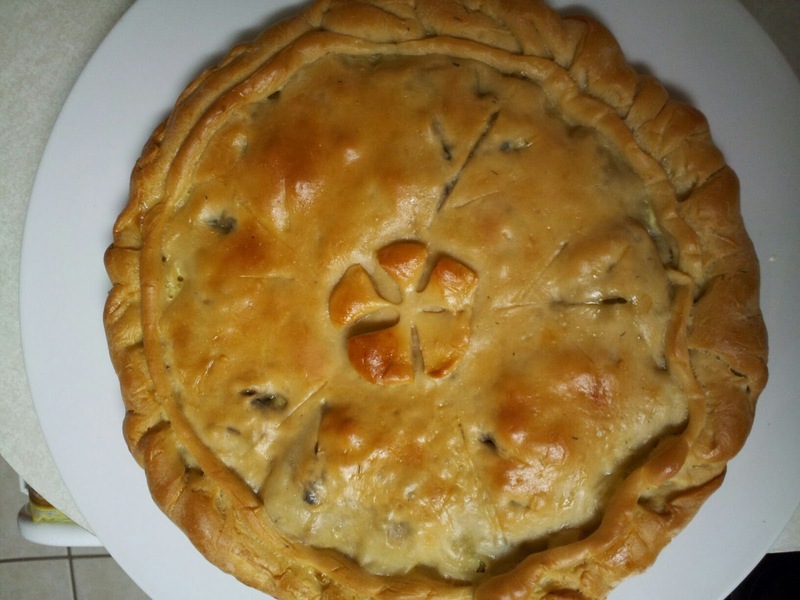 This elaborate oblong-shaped pie originally was made out of pastry dough and several different fillings, one of which was sturgeon, also mushrooms, grains, cabbage, hard boiled eggs, anything that complimented each other. In the mid-nineteen century most popular kulebyaka had 12 (!) layers of fillings for which a wealthy Russian aristocracy had to be on a waiting list for 24 hours if not more. This pie was worth waiting for. Then in the same XIX century it was in fashion among Russian aristocracy to have a french cook in the palace or mansion, and soon enough variation of this pie under the name Coulibiac started to appear in many french cookbooks. And then was my round-shaped kulebyaka with a layer of caramelised onions, topped with a cod, rice and lentil, sprinkled with some dill and sea salt, and encased in a yeast dough envelope. Baked in the 350F oven for 35 minutes. My husband was surprised and sincerely pleased, so was my son, who loves anything baked. Even I enjoyed a piece of "juicy and flaky" goodness. Pineapple and blackberries as a desert added a sweet finishing touch to our Saturday dinner. I love savory pies, and this combination of caramelized onions, cod, rice, lentils, and dill sounds fantastic! And I think you did a fine job of decorating that pie. Thanks for stopping by my place. I will look forward to seeing what else you cook up! The pie sounds amazing - forget the 12 layers - I want yours - not to gorge! You did indeed eat globally - but what a wealth of dishes you presented. I love the history behind food - and the arguments! The pie is stunning! ...and I think your decorating skills are just fine! 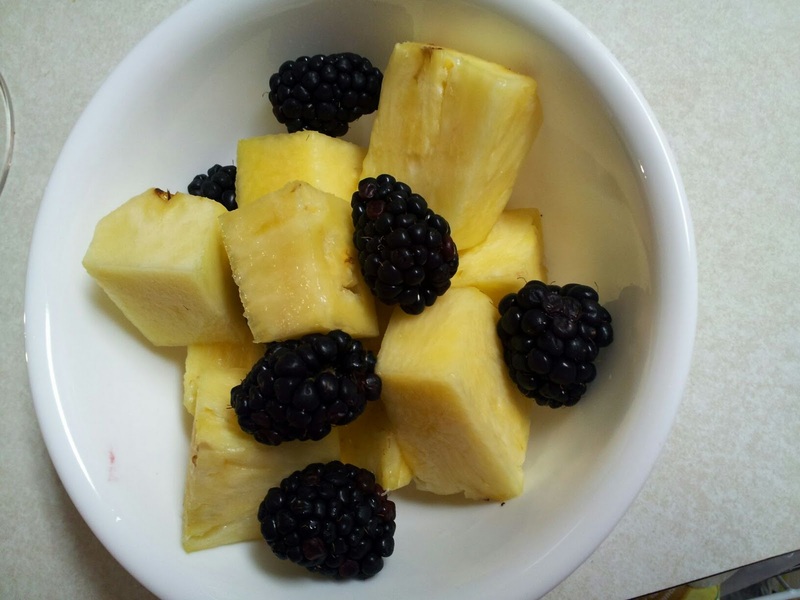 LOVE the photo of the pineapple and blackberries! Thank you Claudia and Ann for your comments.